1/1, May 1859-2/6, October 1860. 16 pp., "Free to the Outcast; To the Able and Willing, 50 cts. a year in Advance." The prospectus for the journal in the first issues grandly and rather self-righteously announced that it was "designed for an entirely new class of readers from any Spiritualistic Periodical started before it, viz: for the Outcast, the Degraded, the Prostitute, and the Enslaved. If we are honored by the continued patronage of these more teachable classes, we shall greatly rejoice. But if we are thrown off from our course, and yield to the temptation to write for the Learned and the Aristocratic, our effort will be a Failure, though our circulation should become equal to that of the New York Tribune. We therefore inform all those [ ] of humanity who would aid us, that they can best do so by securing for us Subscribers from the ranks of the 'publicans and sinners.' We do not offer our paper Free to this class because we are Rich, since by extra hours' labor from our own hands, heads and hearts, we print, edit and publish your paper, though our joint incomes do not equal $1.75 per day." The description of the journal given in its advertisements ("Advocates Spiritualism, Socialism, Anti-Slavery, Non-Resistance, Woman's Rights, Anti-Oath-Taking and Office-Holding, Temperance, Vegetarianism, Anti-Tobacco (Tea, Coffee,) and Any Other Reform Which Requires the Practice of a Higher Life") nicely encapsulates the universal reform movements of the time. Bryan Jabez Butts (1819-1881) took over the Hopedale Press when the Practical Christian failed in 1860. He was a "professor of Elocution and Mental Philosophy" and author of a "Philosophical Poem on the Conjugation of the 'Verb To Be'” (under the name "J.V. Beneficio"), and in later years was a contributor to A.J. Swarts' Mind Cure Journal / Mental Science Magazine. In 1859, Greene (1819-1881), a poet, playwright and ardent spiritualist, of dreamy and passive nature, married Butts, a radical feminist (who issued a protest of marriage on the occasion of their wedding), and this journal was the fruit of their union. Both Butts and Greene were universal reformers, writing on "Platonic 'Free Love,'" industrial independence of women, abolition, and the like. They were members of Adin Ballou's Hopedale Community (1841-1856) of utopian idealists who strenuously devoted themselves to abolition, temperance, women's rights, and pacifism--the last a difficult position to maintain at the beginning of the Civil War. 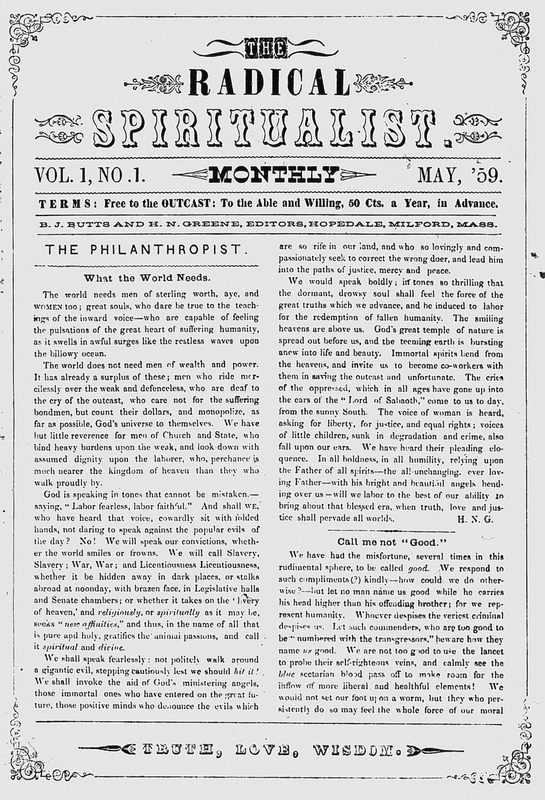 Spiritualism was given prominent but secondary place in the journal, with "Notes on Spiritualism" and regular mention in "Editor's Portfolio," along with brief mentions of visiting mediums and of other journals. Syracuse University; Harvard University; University of Alberta.